Reacting to the U.S.-South Korea decision to adopt THAAD, North Korea fires off another KN-11. 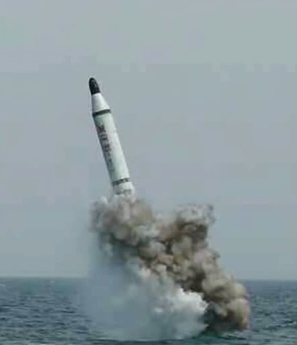 A day after the United States and South Korea announced their decision to deploy an advanced missile defense system on the Korean peninsula, North Korea once again test-launched its KN-11 submarine-launched ballistic missile. The missile was fired at 11:30 a.m. local time on Saturday. The test failed, according to assessments by South Korea’s Joint Chiefs of Staff. The KN-11, which was last tested in April 2016, reached an altitude of 10 kilometers before exploding on Saturday. South Korean assessments noted that the KN-11 was ejected from North Korea’s sole 2,000-ton Sinpo-class submarine. “The SLBM was ejected from the submarine normally, but [we] estimate the initial flight was unsuccessful,” the South Korean Joint Chiefs noted in a statement. The U.S.-South Korea alliance had reached a decision on Friday morning to deploy the Terminal High Altitude Area Defense (THAAD) system, amid concerns about threats to South Korea from North Korean ballistic missiles. Moreover, earlier in the week, the United States, for the first time ever, listed North Korean leader Kim Jong-un under sanctions. Both moves together suggested that North Korea, as it is known to do, would lash out with a missile test. Pyongyang recently concluded a spate of testing for its road-mobile intermediate-range ballistic missiles, the Hwasong-10 (or Musudan). A test conducted in June was declared successful after five prior failed attempts. As I’ve discussed before in The Diplomat, the KN-11 SLBM program is particularly important for North Korea. If successfully honed and developed, the KN-11 could be an important delivery vehicle for North Korea’s compact nuclear weapons, granting Pyongyang a survivable second-strike capability (i.e., if the regime fell in Pyongyang as a result of a South Korean offensive, a North Korean submarine could deliver a retaliatory nuclear strike, causing unacceptable damage to South Korea). Even though Pyongyang currently possesses a single prototype Sinpo-class submarine capable of launching the KN-11, both U.S. and South Korean defense planners have expressed concern about its steady progress on the SLBM. The missile, also dubbed the Polaris-1 by North Korea, was tested for the first time just over year ago from a submerged barge. Pyongyang, in April, demonstrated a moderately successful test of a solid-fuel variant of the missile (after showing off other advances in solid fuel propellant technology in March). As I’d discussed in April, a solid fuel KN-11, though sacrificing some efficiency and performance, considerably reduces the risk of an accident on board the North Korean submarine. A new database offers insight into 33 years of North Korean missile testing.